"Say, isn't that BioShock?" you may be rhetorically asking. "Why, yes it is," I would respond, for that will be the game I'll be playing through this weekend, a three-day weekend for me. 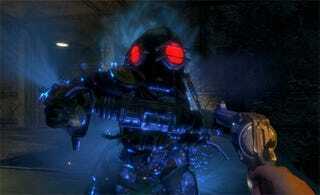 "Why are you playing BioShock one this weekend?" you're probably not asking, but might upon reading that a copy of BioShock 2 is resting just feet away from my Xbox 360. Well, I never actually finished the first BioShock, which someone who is reviewing the sequel really ought to do, don't you think? Yes, I think we can all agree. So I'll be playing BioShock, BioShock 2, Glory of Heracles, MAG and Muscle March over the course of the next 72 hours, all in anticipation of reviewing almost all of those games over the next two weeks. It's going to be a busy two weeks, especially with a trip to San Francisco thrown in there and ten regularly scheduled posts per day to write. What about yourself? How many dozens of hours of obligation gaming do you have planned? Let us know in the comments!